This might be my most favorite thing I have come across in awhile. Its funny how you can add hooks and bookshelves and all sorts of organizational items, and then *stuff* just accumulates and overtakes everything. About a year ago, we turned an old closet in our laundry room, into a cubby area. We have hooks for coats, bins for shoes, bins for other things. Its awesome, I love the space. But the kids come home, and the backpacks are all over the place, coats are on the floor – its a disaster! Across from the cubbies is a big blank wall, that is just screaming for this backpack and messenger center. A spot where we can put all of the paperwork we have to sign for school, homework assignments – so we aren’t digging things out 2 minutes before the bus comes. This one is definitely going to be my project for the weekend! 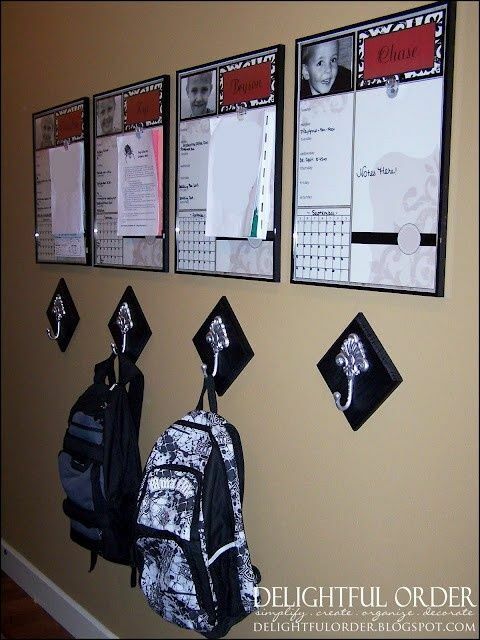 I would add to this, some sort of narrow bin where we can insert papers – homework assignments, weekly schedules, etc. Otherwise, its perfect! Check out the full tutorial over at Delightful Order! !